As of recently it is possible to run Kindle for PC application via Wine on Linux. I tested it on 64-bit install of Ubuntu 10.10 and put together this step-by-step instructions and a short review. Enjoy! You will need to install Wine Windows Emulator 1.3. * or higher. Unfortunately, at the time of writing this version is still in the unstable branch and can’t be installed through default Ubuntu software repositories. Fortunately, installing the “unstable” branch is quite easy and it is not that unstable. Just type this command in your terminal window and it will all happen automatically. You will only need to accept the EULA for true-type fonts. Navigate to “Kindle for PC” page in your favorite browser and download the installer. The app will install and prompt for registration just like it does on Windows. Overall the app runs and works nicely but with minor quirks. Books download, you can read books, highlight passages and annotate. I couldn’t get dictionary lookup to work. On one of the two machines that I’ve tested the application refused to download dictionary claiming that it is not in my archived items and on the other it froze the entire virtual machine when it attempted the download (could have been a VM issue). 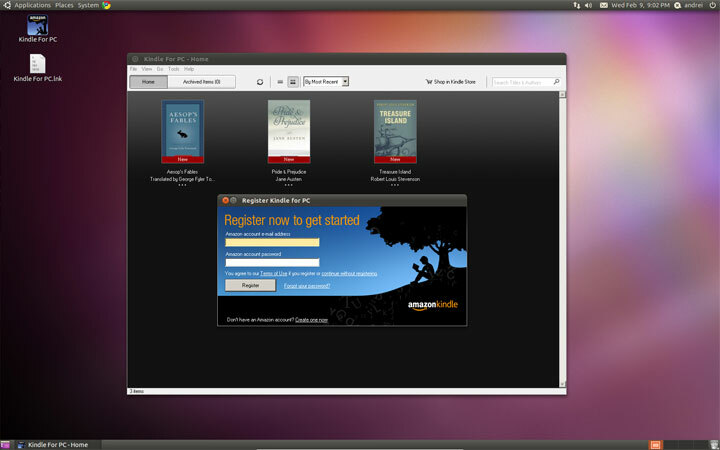 But aside from this quirk you can totally read Kindle books on your Linux box. You can also use Google and Wikipedia for definition lookup. This entry was posted in Kindle For PC and tagged Linux, Ubuntu, Wine by Dzmitry. Bookmark the permalink. FINALLY! very good news…can’t wit to try it out! The benefit is that should something blows up .wine, the kindle application will still work fine. Actually, You don’t need the terminal to use Kindle for PC in Ubuntu. You will need to give you password a few times. How does one “accept the EULA”? I’m clicking “enter” and all sorts of keys but it’s just sitting there. Maybe you have to type “yes” in the terminal. Actually, the acronym “WINE” stands for “Wine Is Not an Emulator” … :) So saying “Wine Windows Emulator” is a bit of a misnomer, FWIW. I think they prefer to refer to it as a “Windows Compatibility Layer” — really it’s more like a little piece of “glue” to run windows programs in Linux, than a full-fledged emulator. It doesn’t have a VM at all, it’s actually a bit faster than using a VM by just providing an in-between layer. Cheers, and thanks for sharing your experience with it. ???????? First time with WINE by the Way . Regarding WINE freezing when downloading the dictionary — I stumbled on a workaround. I noticed the same behavior — when the dictionary was downloading, Wine/Kindle App seemed to hang. However, I noticed that if I clicked the “More” pulldown on the bottom right of the “dictionary is downloading” dialog, the progress bar moved from 0% to 3%. Progress stopped when I stopped interacting with the dialog. install the Chromium web browser, and then add the Kindle Cloud reader to that. working well in natty with wine 1.3. I followed directions, then just rt. click on my *.mobi’s and reading all fine. I have tried to install the Kindle for PC application on my Ubuntu box, but no success! Installed Wine 1.3, downloaded the Kindle app and installed it by right clicking and choosing with Wine. Get an Icon for Kindle (and another one for Kindle ink), but when I try to run it a get an error message about “a serious problem with the program” and am told to contact http://www.appdb.winehq.org – but that site doesn’t seem to exist! Linux is a non-commercial software – there are no guarantees, support or anything of the sort. You get what you pay for. Which in case of linux is free. however if you really care about this issue, write to Amazon and voice your support for a Linux-specific interface.